For the finest, detailed impressions. Provides thin, fast-drying films. For diving, mold making, textile coatings and applications in the make-up effect. 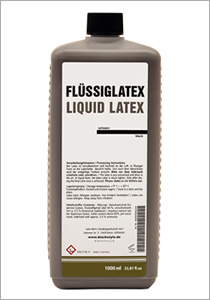 We offer our latex in three fluid grades (viscosities). These can be mixed with each other as desired. The same applies to the colors. From the primary colors every new color can be mixed. Further liquid latex and latex paste can be found in the selection below. The latex is pre-vulcanised and dries in the air. Stabilized with approx. 0.3% ammonia.